Hobbits & Hairdye: Autumn Tag. In case it wasn't obvious enough already I love Autumn. This time of year makes me so happy. As around this time last year I did the I heart Autumn/Fall Tag I really wanted to do another Autumn post, but didn't want to do the same one as not that much has changed -- what can I say I'm boring! I saw this post on A Scottish Lass's Blog and thought I'd give it a whirl myself. I love the colours, I find that everything looks so much more beautiful in Autumn & I really enjoy the weather -- its not hot anymore thank goodness but its not numbingly cold! I just love that its the perfect time of the year to be outdoorsy. Growing up in the countryside I was always an outdoorsy girl and going on autumnal walks is just one of the most relaxing past times ever! Plus Halloween! I'm a massive sucker for Halloween & genuinely think both Autumn and Halloween are vastly underrated in this country. Boo! They all have the different aspects/scents that I really associate with this time of the year. I'll confess now, I'm really bad at moisturising, but when Im having a miracle day I use Soap & Glory Righteous Body Butter for my body & a Benefit moisturiser for my face. Go to colour for eyes. Neautral colours. Browns, Golds, nudes! My classic look is a smokey brown eye make up, black winged liner or black smokey eyes! & that doesnt really change much. I'm not very adventurous with my eye make up. Favourite music to listen to. Although I'd say in general I'm a bit more of a rocky girl, I do love listening to very chilled out music this time of year, especially when going on an autumnal walk. I cant really give specific examples, if I hear something and like it I'll listen to it. Casual: Jeans, a shirt/plain top, Long boots & a coat or leather jacket. Smart: A simple smart dress, black tight, creepers & leather jacket or coat. I tend to mix it up around those basic ideas. The past three years a real autumn treat has been getting to go home for a week in october, at university we have a reading week at the end of October. As I mentioned before -- unless you've fallen asleep -- Im a country girl at heart, so there is nothing i love more than getting to go back to the country side for a little bit at this time of year, I'm also always home for halloween which I love because it just reminds me of my childhood. I challenge all of you to do this! If you do then please link it below -- I'm nosy & love autumn so makes great reading for me. 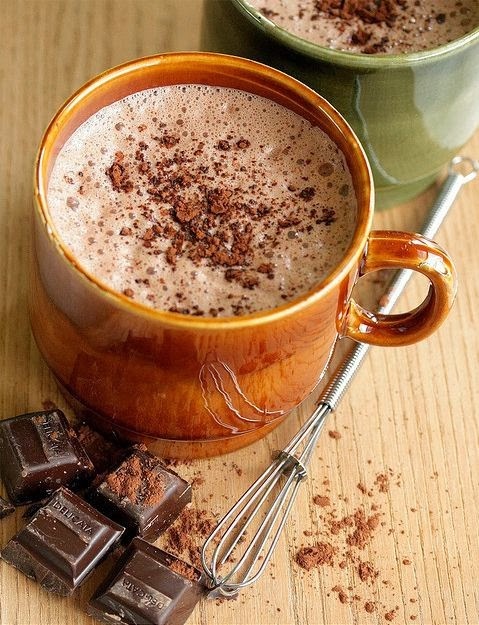 You can't go wrong with a good old hot chocolate! And there's something so satisfying about trampling across the countyside in windswept weather for a walk that your parent have forced you on, then to come home into the warm. Oooh this is a lovely tag! I think I will try it out for myself tomorrow!